I spend a large proportion of the week as a primary school Wider Opportunities music teacher. The instruments I teach vary from year to year. At the moment I am teaching 6 different djembe classes, in different schools. (I also teach 4 different samba classes, 3 ukulele classes and 6 recorder classes…) In the case of the djembe classes, the variety of the class dynamics is astonishing especially when one considers that the class sizes and the ages of the children are so similar. I am experimenting with how the children address me. Usually, I introduce myself formally, but in two schools I have introduced myself by my Christian name. I noticed that the percussion teachers tend to be more informal, and that the children regard them as some kind of “special”, and slightly exotic visitor. They are a little shy, but obviously feel very daring when they use the teacher’s “real” name. I thought I would see if using my Christian name would give me the same kind of “glamour”, and to my great pleasure, it has. Having said that, these two classes (and another, where I am treated more formally) have incredibly high standards of class behaviour. I have only met this in one or two other school in among the dozens I have worked in over the years. Both classes have a couple of “characters” in them, but they are easily checked. Usually just a raised eyebrow or surprised glance has been enough to dissuade any inappropriate behaviour. We get So Much Done each week! In just half a term, and it has been a very short half term, the classes have learned three songs, singing them as a round, or with an ostinato, or with a drumming pattern. 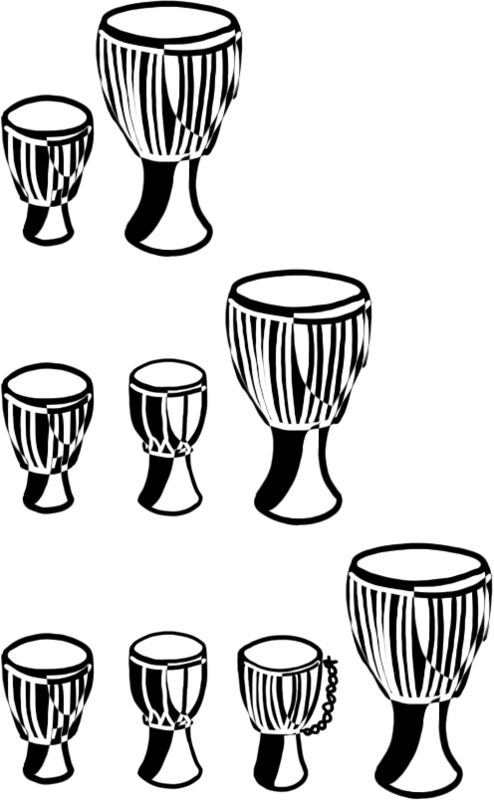 We have also played a variety of pulse and rhythm games, and have three djembe pieces in various stages of development. Two other classes are what I would call “normal” – averagely focused, averagely attentive. I do the same activities, slightly tailored to take into account that we don’t accomplish as much. We spend time waiting for the last person to stop talking, or to be ready to play, or I have to repeat instructions, or we need more “trial runs”. So, in half a term we have done maybe two activities, learned one song, learned one djembe piece, not progressed yet to playing or singing in parts. One class seems to be entirely composed of individuals. Getting them to listen each other, or to me, is hard, hard, work. There was a brief moment, a couple of weeks ago, when everyone suddenly managed to play together, in time, in unison, in harmony. That felt so good – even the children noticed it. I am slowly getting this class to come together. This week, we started learning a new song, and I awarded “marks out of 5 for effort” as we sang, by walking round the circle showing each child how many fingers I was awarding them as we were singing together (they all eventually reached 5 out of 5). The same technique of encouragement, directed at each child in turn, while we were drumming, improved everyone’s attention and performance. For this class, an instant and visible response to their effort, like a talent show “clapometer”, seems to be the key to keeping them involved and positive in their response to the activities. Well, I didn’t go in for teaching in order to have an easy life! This entry was posted in Djembe, Lessons that have happened and tagged teaching. Bookmark the permalink.